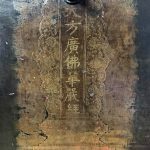 16th/17th century, raw lacquer mixed with clay powder over core wood, Shanxi; storage of Chinese scripture of “Avatamasaka Sutra”. 23″w, 17.5″d, 23″h. This chest contains a portion of the scripture of “Buddhavatamasakamahavaipulya-Sutra”, known as “Avatamasaka Sutra” in short. The sutra has 80 chapters, with 700,000 words, which needs a person 8 hours a day, 7 days to finish reading it. Every year there is a very grand rally called Shui-Lu rites at which all the masters will attend and takes 7 days to read the scriptures. The Sutra is one of the most influential Mahayana Sutra of East Asian Buddhism. The Chinese calligraphy inscribed on the front of the chest can be translated as “Extensive, Dignified Flower Adornment Scripture”. The “flower” here is an archaic reference to a manifestation of the beauty of Buddha’s virtue and his inspiring glory. 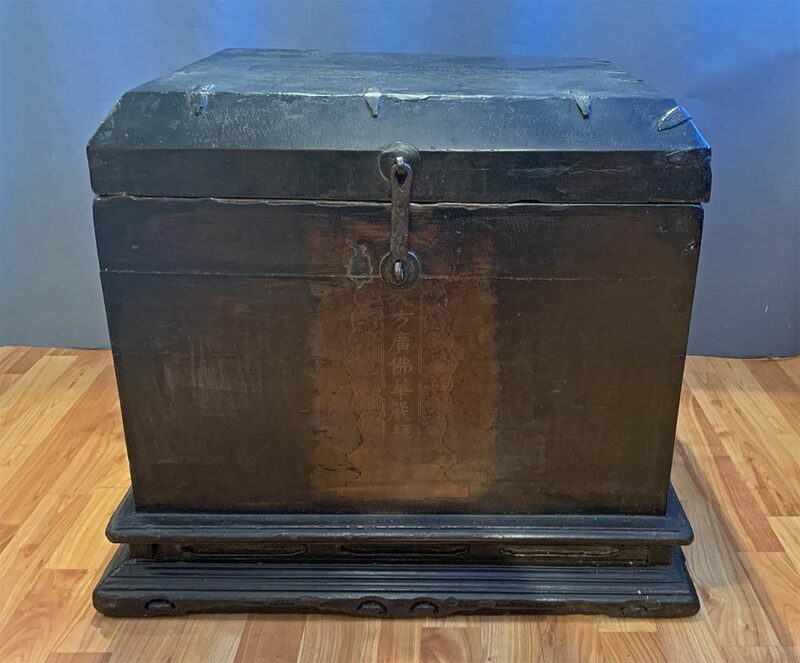 Since there are only two known translation of this flower-sutra into Chinese, done long time ago, this chest most likely was used to store portions of this Chinese translation and is very rare. The screen painting in front in the form of a plaque is done in Miaojin (li. “trace in gold” decorative lacquer style, which was very popular during late Ming period. 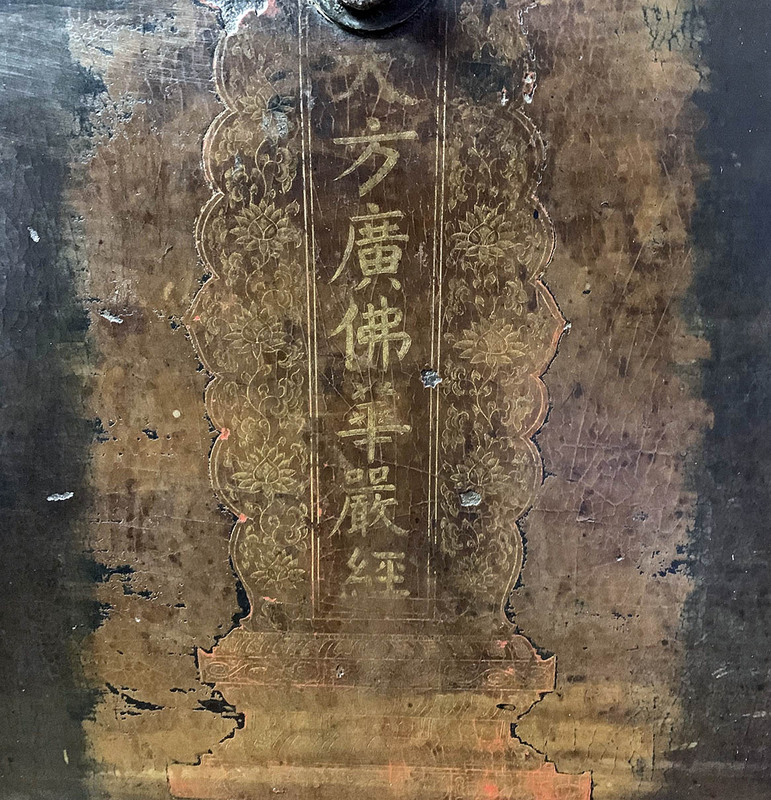 Except for this decorative plaque in front, the surface of the chest as well as the inside are all covered with thick black lacquer mixed with clay powder and completely devoid of other painted decorations, suggesting how pure the intention is in constructing the chest for preserving the Buddha’s doctrine. The original thick lacquer on the surface of the chest is crackled all over, showing soft cupped circles that create a leathery “snakeskin” appearance. The patina of old age with this crackling-look is valuable to the piece. (Can show photos of a Shui-Lu grand rally on request).